Heroes of yesterday, Gods of today…. Theater, street plays, wanderer storytellers have always given face to what were mere descriptions in the scripts. These tales, a brainchild of our epic writers like vyas, valmiki, kalidas, tulsidas… glorifying and immortalizing their heroes, provided for the performances in the history, the filmmakers of today are following their footsteps. Starting from folk story tellers like puppet artists, Charamkari puppeteers to theater groups traveling places, enacting tales from epics to the early times ofIndian cinema, as a new stage for the mythological stories and stories of our history, all have successfully given faces to their written characters, faces that we idealize today as our worthy kings, faces that we pray today as Gods….Indian cinema has come a long way since those times and so have the heroes and Gods of today. The birth of cinema in Indian history was the beginning of a whole new industry, which along with occupational opportunities, laid a base for many art and craft forms like set making, costumes, make up, jewelry and poster making. 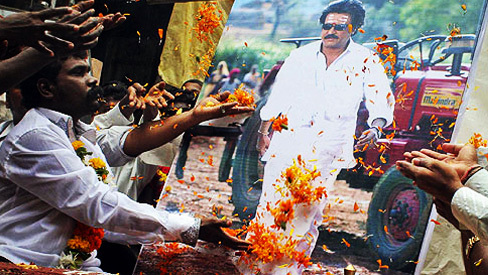 One of the many artists who contributed with their skills was late Mr. R Gajjar. A talented self taught artist who started his journey painting backgrounds of the theater sets. 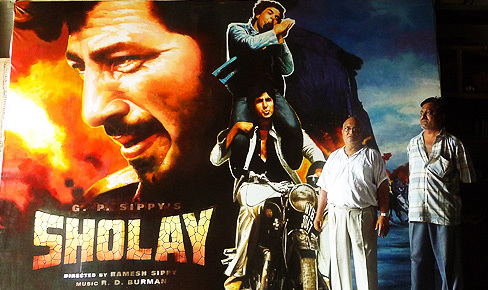 He got is first big break as a movie poster artist in 1932 when one of his painted backgrounds for a play got appreciated by guests from the film industry. 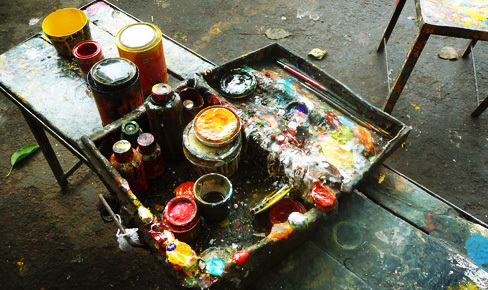 “His work was his signature, people would distinctly recognize and call out his name” says his son and now owner of the studio, Mr. Janak bhai Gajjar. The process unlike any other craft is very simple and purely skill based. Off white color of grey muslin fabric is quoted with a strengthening paste of white chalk powder and adhesive, boiled in double quantity of water, however, now canvas is used. While the carpenter prepares the wooden frame, on which the fabric is going to be stretched,the artist divides the small photograph to be replicated into a square grid. The same grid is magnified on the canvas, first pencil sketched, then painted and then final touch ups. Like a piece of art demands for its originality to be intact, no matter how big the canvas is, the person to start is the one who ends it. 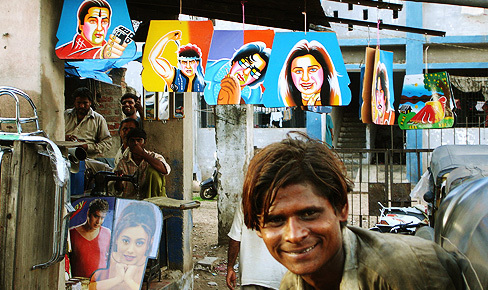 And a trained artist can stretch up to three large sized posters (45’ x 24’) per day, if need be. The art owing to its harsh strokes can best be appreciated from a distance, as it is meant for distant viewing only. 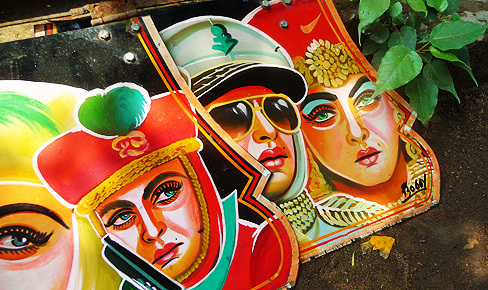 The influence of cinema percolated deeper into the lifestyle of people and the art form took a new dimension in the form of Auto Rickshaw decorations about thirty years ago. 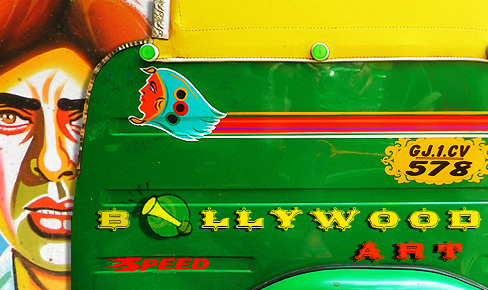 The eclectic combination of Indian street aesthetics and bollywood made autos an exhibition on wheels. 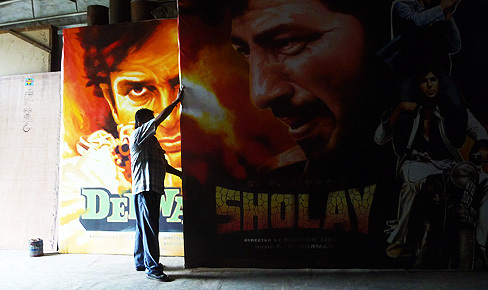 This also became a way of keeping the unique art language alive; when the hand painted posters were fast getting replaced by printing technology. 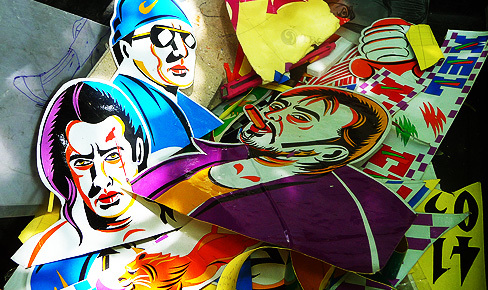 Saleem Bhai and Bobby are few popular names amongst the auto rickshaw drivers, who switched from painting posters to making radium stickers of film stars. These stickers are made by cutting sharp lines and curves of many colorful radium strips and layering them up to make faces and highlights on the faces of the stars. The use of flat, bold colors in making this pop street art makes it popular not just amongst auto drivers but many a designers aswell. Hot and vibrant as it is, this contemporary craft is the most beautiful way of keeping us close to our very own bollywood masala movies, which in turn is a representation of our society.